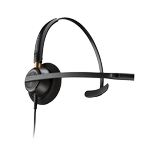 Plantronics HW510 Headset - Headsets Direct, Inc. This is a quick introduction to the Plantronics EncorePro HW510 business-grade corded headset. The Plantronics HW510 headset is a headband over the head with a speaker on one ear. This headset comes with a noise-canceling microphone. The ear cushion is a soft foam cushion and is easy to replace. The temple pad on the other side of the headband is flexible, so it fits above your ear and makes the headset very stable. The noise-canceling microphone is adjustable, so you can use it on either your right ear or your left ear; you just swing it over to the other side. When you put a headset on, you want the microphone to be roughly a quarter of an inch away from your mouth. The best way to test the positioning is to slide your finger between the end of the microphone and your mouth. The microphone also has ridges, so you can easily bend it to get it into perfect position, so your voice will be heard well. The noise-canceling part of the microphone means it will cut down on background noise around you, so your caller can really hear you. The Plantronics EncorePro HW510 headset works very well in an average-to-loud office environment. Because it covers just one ear, leaving the other ear open to hear what is going on in your work place or allowing you to have a conversation with a co-worker without removing your headset, so you have the luxury of leaving the headset on all day. The HW510 headset is very universal, making it easy to use in almost any application. That is because the cord’s bottom piece is called a quick disconnect. All you need to make your headset complete and usable on almost any phone is a bottom cable or amplifier. The cord you need will vary depending on which phone, PC, or tablet you are using. It is very important to get the proper cable or amplifier, so it is best to give us a call, and we can tell you which cable will be compatible. This headset comes with a clothing clip, which makes using this headset more comfortable. You just clip the clothing clip to the edge of your collar or shirt, and when you turn your head or pull on the cable, the headset always stays perfectly positioned, it’s the clothing clip that takes up the slack when the cord is pulled. The Plantronics HW510 corded headset is a really great, all around headset for both business and personal use. If you have questions about this, or anything else, just give us a call at 1-800-914-7996, or visit us online at www.headsetsdirect.com.